"A helpful article with lots of good info. Should include advice to remove the ... read full review"
A bulbous plant consisting of single head containing smaller bulbs or cloves individually wrapped in papery skins, which are all wrapped tightly together with another layer of dry papery skin, forming the bulb head. Garlic, like onions, leeks and scallions, are part of the allium family. Garlic, one of the most important and widely used seasonings for food dishes, is available fresh or dried. However, dried garlic is the most commonly used type of garlic and can be found in a white, pink or purple variety. When it is used in a raw form, it is pungent and slightly bitter, but it becomes very mild and sweet when sautéed or baked. Garlic is most often used as a flavoring agent but can also be eaten as a vegetable. It is used to flavor many foods, such as salad dressings, vinaigrettes, marinades, sauces, vegetables, meats, soups, and stews. 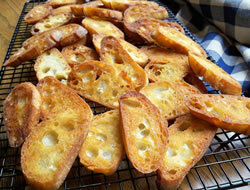 It is often used to make garlic butter and garlic toast. 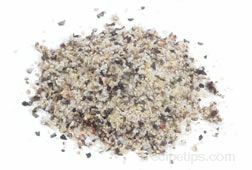 Garlic powder can be substituted if necessary - 1/8 teaspoon of garlic powder is equal to one medium fresh clove of common garlic. When selecting, choose firm, plump bulbs that still have their paper-like skin intact. 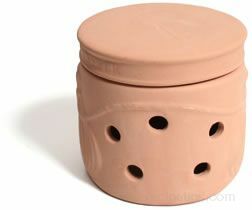 There should be no signs of sprouting, soft spots, or other blemishes. Fresh garlic is readily available year round. Garlic is available in forms other than fresh, such as powder, flakes, oil, and puree. 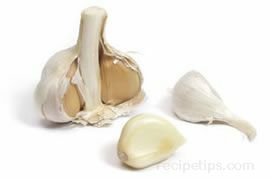 Store fresh garlic in a cool, dark, dry place that is well ventilated for 4 to 6 months, but is best when used within a few weeks. When the cloves have been removed, they can be stored frozen for several months. If garlic has been chopped, minced, or prepared in any way, it should be refrigerated. 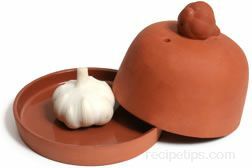 Be sure to store in an airtight container in the refrigerator to prevent the garlic odor from affecting other foods. Softneck garlic is the common garlic found most often in the supermarket, which is generally one of two varieties, Artichoke and Silverskin. 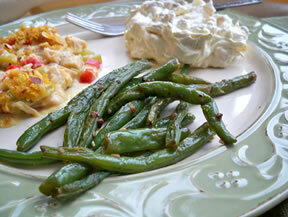 They are whitish in color and their flavor ranges from very mild to very hot. They have the longest storage time of all types of garlic, if stored properly, and are often used to make braids of garlic. Common garlic bulbs can yield 12 to 16 small cloves. Rocambole A hardneck variety of garlic, which has a thick hard center stem with even sized cloves growing around it. The cloves do not have much papery skin covering the bulb to protect them, which results in the cloves being knock off if not handled with care. Hardneck garlic has a flowering stalk and their bulbs contain four to twelve cloves. 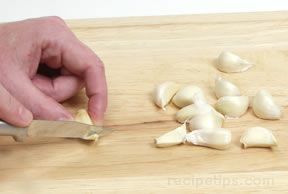 The skins on the cloves are much easier to remove than on the softneck garlic. The Rocambole is the hardneck garlic variety that most closely resembles the softneck common garlic. 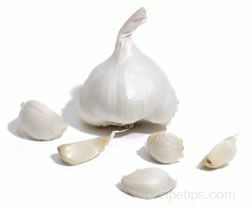 Elephant garlic will yield 6 to 8 large cloves that are 2 to 3 times larger than the smaller cloves of the common garlic. Although it is larger in size, it has a more mild flavor. Its cloves are yellowish in color. Because of its mild flavor, it can be sliced and added to fresh salads. The Elephant garlic is not readily available but can be found in local markets in the fall of the year. Elephant garlic, is also referred to as Giant or Spanish garlic. Green garlic is garlic that is harvested when it is immature. It has a definite garlic flavor without the bite of mature garlic. It can be eaten fresh like scallions or green onions but it can also be used in other foods the same as mature garlic. The results will be a more mild garlic flavor. 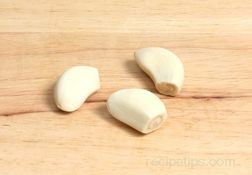 They should be harvested just before using because they cannot be stored for a long period of time like mature garlic. 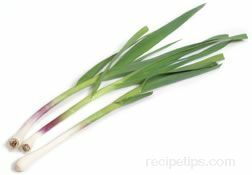 Green garlic can be stored in the refrigerator for 3 or 4 days. Also referred to as spring baby garlic. Garlic cloves can range in size from small to extra large, so when a recipe calls for a specific size it is important to be aware of what it is referencing. If the size is not taken into consideration it can greatly affect the taste of the end product. Shown below are the size differences and some information to help you determine if you are using the proper amount of garlic that is called for in the recipe. An extra large clove of garlic will be approximately 1 3/8 to 1 1/2 inches long with a diameter of 3/4 to 7/8 inch at the widest point. A large clove of garlic will be approximately 1 1/4 to 1 3/8 inches long with a diameter of 5/8 to 3/4 inch at the widest point. A medium clove of garlic will be approximately 1 1/8 to 1 1/4 inches long with a diameter of 1/2 to 5/8 inch at the widest point. 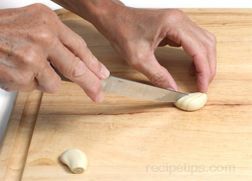 A small clove of garlic will be approximately 1 to 1 1/8 inches long with a diameter of 3/8 to 1/2 inch at the widest point. The chart below will also help in determining the proper amount of garlic to use. Note: The above figures are estimated amounts and sizes. They will vary according to your own estimation of the size of the clove. The clove can now be cooked whole, or it can be sliced, chopped, minced, or smashed. 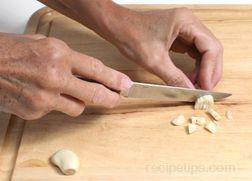 The intensity of flavor of fresh garlic depends upon how the garlic is prepared. See below for how the different preparation methods for garlic affect its flavor. The juices and oils of whole garlic have not been extracted, which results in a mild flavor. Larger pieces, such as slices, will not totally dissolve when cooked, which will result in a milder flavor than chopped, minced, or smashed garlic. To slice, place the peeled clove on its side and make thin crosswise cuts. 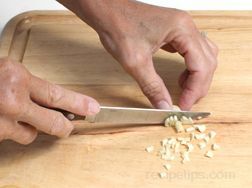 When it gets so it is hard to hold on to the clove, turn it so the flat cut side is down on the cutting board. Finish cutting in thin slices. 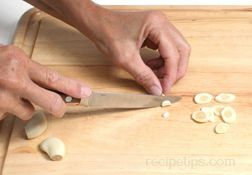 Chopping the garlic into smaller pieces will allow a little more of the juices and oils to be released. This will provide more flavor than slicing and the amount of flavor will depend on the size of the pieces. The smaller they are the more flavor will be released. To chop the cloves, first make several lengthwise sliced through the clove but do not cut all the way through the root end. The number of slices you make will depend on the size of the clove and how big you want the chopped pieces to be. After making the lengthwise slices, turn the clove and cut the clove crosswise to create the chopped pieces. Cut to desired thickness. Mincing the garlic cloves releases a large amount of juices and oils to provide a strong flavor to the other ingredients of the dish the garlic is cooked with. 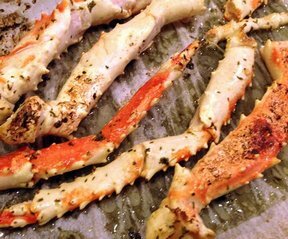 Begin by slicing lengthwise as you would when chopping the cloves, only cut in to thinner slices. Turn the clove and cut crosswise in thin slices to create small pieces. 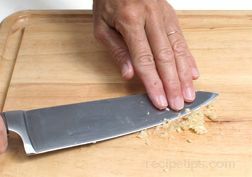 After the pieces are cut, scrape them into a pile and begin cutting the pieces into smaller pieces with a chef's knife. 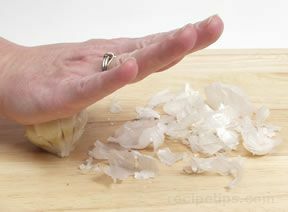 Place the palm of one hand on the top of the blade and with a rocking motion, move across the pile of garlic, cutting them as you go. Several passes will have to be made to cut them into fine enough pieces. Scrape the garlic back into a pile as needed. When the cloves have been smashed they provide a very intense flavor because much of its juices and oils are released. The only methods that will produce more flavor is pressing or pureeing the garlic. 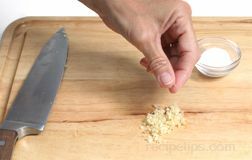 Mince the garlic as shown above and then sprinkle very lightly with salt. 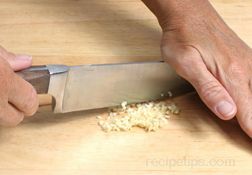 Place the flat side of the chef's knife on top of the minced garlic with the cutting edge away from you. Using your other hand, apply pressure by placing your fingers on the blade and pull it towards you. Then push it back up in a slight circular motion. Continue this motion repeatedly over the garlic until it is all smashed. The garlic will be slightly liquefied. Caution must be taken when cooking garlic so that it is not overcooked. Garlic burns easily and when it has been cooked too long or on too high of a temperature, it will turn bitter. Some of the common cooking methods are shown below. 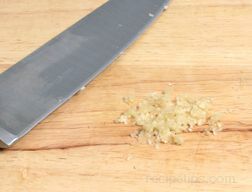 Sautéing is the most common method used for cooking garlic. It will bring out the nutty but savory flavor of the garlic. Garlic can be sautéed in oil or butter but be careful is using butter because is will burn much faster than oil. 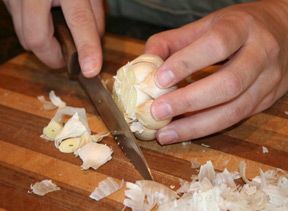 Remove the skin from the garlic bulb and cut off approximately 1/4 inch of the tips of the garlic. 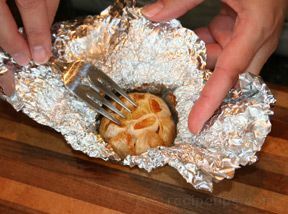 Place the bulb on a piece of aluminum foil large enough to wrap the garlic. 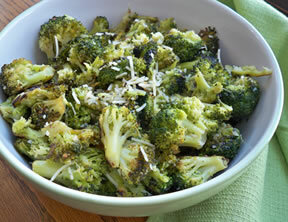 Then drizzle it with vegetable oil, canola oil, or olive oil. 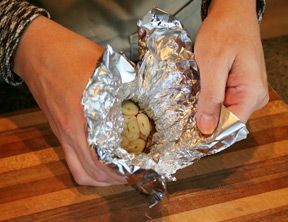 Wrap the bulb tightly in the aluminum foil and place in the preheated oven. Roast the garlic bulb for approximately two hours or until the cloves are tender when poked with a fork. 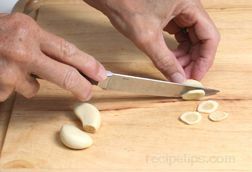 Prepare and peel the garlic cloves as shown above. 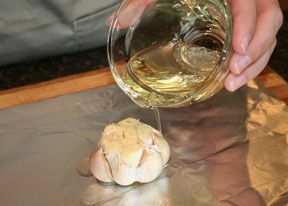 Place the individual cloves in a greased roasting pan and drizzle lightly with vegetable oil, canola oil, or olive oil. Place in the preheated oven. Roast until cloves are soft. The individual cloves will cook faster that a whole garlic bulb. Cooking time is approximately one hour. Use a heavy bottomed deep pan, such as a saucepan and add oil. Heat oil on the stove until it is very hot but not smoking and then add garlic cloves. Fry cloves only until they turn a medium brown and the remove from the heat. Watch very carefully as they begin to brown to avoid burning them. Burnt garlic will have a bitter taste. 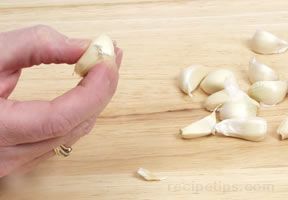 To remove the garlic odor from your hands when working with garlic, wash hands thoroughly and then use some type of stainless steel device that can be worked over and around the areas affected on fingers or hands. Stainless steel contains the mineral nickel which acts as a neutralizer for the garlic odor. 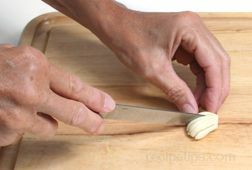 Several manufacturers provide a kitchen utensil, similar to a flat bar of soap made of stainless steel, that can be rubbed over the hands after coming in contact with garlic. Other options include using a faucet or stainless steel sink surface to rub hands on after first washing the exposed areas. "A helpful article with lots of good info. Should include advice to remove the green middle of garlic. And, didn't answer the question re: what to do about harsh taste of garlic - the question I had searched."